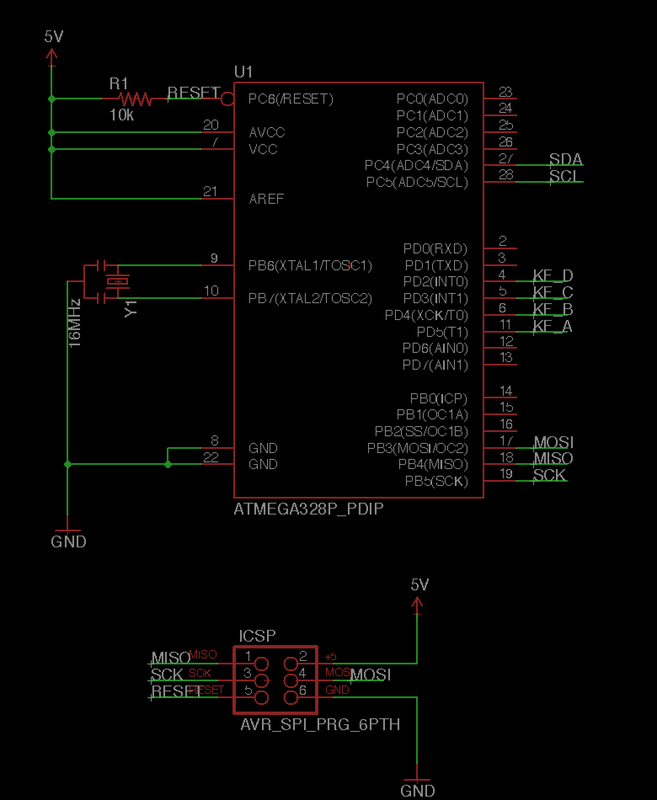 I’m trying to program an ATmega168 using an AVRISPmkii via the 6-pin ICSP on a board I “designed” (my first). The chip works fine on the board (it runs the program on it properly, responding to inputs and doing the right thing for outputting to a display), as I’d previously programmed it on a breadboard. It has the Arduino bootloader on it, in case that’s relevant. The ABRISPmkii is able to program the same chip if I move the chip from the custom board onto an Arduino Diecimla board, using the exact same avrdude command. I’ve checked the board for shorts. I’ve checked for continuity on the 6 connections, from the pins on the headers to the pins on the chip, 5V and GND. I presume this means there’s something wrong with the board design, but I can’t see what I might have done wrong. System wide configuration file is “/Applications/Arduino.app/Contents/Resources/Java/hardware/tools/avr/etc/avrdude.conf"
User configuration file is "/Users/dave/.avrduderc"
Any idea what I might have done wrong or what further troubleshooting steps I could try? Finally found a solder bridge between MOSI and GND that was causing this issue. Not the answer you're looking for? Browse other questions tagged atmega avrdude icsp or ask your own question.